Following a "mixed methods" approach, this research is designed to examine whether teaching English as a foreign language (EFL) in Egypt's public schools matches the communicative English language teaching (CELT) approach. Qualitative and quantitative data were collected from 50 classroom observations, 100 questionnaire responses from teachers, and 10 face-to-face interviews with follow-up discussion sessions. The results indicated that, despite of all the CELT-demanding policies of the Egyptian Ministry of Education, practising teachers are mostly unaware of CELT principles and know-how implementation. Some key problems and challenges facing CELT implementation along with proposed solutions and recommendations are discussed. The 21st century came with a revolution in information and communication technology that has swept the international communities and changed our world to a small cybernetic village. Electronic means of communication collapsed the geographical boundaries between nations, and promoted the need for a common language. English has emerged as the language most used for international and intercultural communication, and non-native speakers of English now exceed the number of monolingual native speakers (Hismanoglu & Hismanoglu, 2013). In particular, English has become the international language of commerce, tourism, science and technology. As a result, many people around the world experience an "English fever". Treating such a "fever" requires people to have a great desire to learn English, especially how to engage in an actual, meaningful and comprehensible conversation (Rowe, 2016). As stated by Leung and Scarino (2016), "a reconceptualization of our approach to language/s education in ways that recognize a diversity of goals for people from different backgrounds" is required to cope with these changes. Unfortunately, traditional methods for teaching English as a foreign or second language in many countries around the world, especially in developing countries, have not yet been successful enough to empower learners with English communicative competence. The communicative competence concept was originally developed and coined almost five decades ago by the sociolinguist Dell Hathaway Hymes (1966, 1972), who defined it as "a term in linguistics which refers to a language user's grammatical knowledge of syntax, morphology, phonology and the like, as well as social knowledge about how and when to use utterances appropriately". A communicative approach to English language teaching had to be sought to replace ineffective traditional approaches and methods, e.g., grammar/translation, direct method, and audio-lingual method, to develop learners who can communicate successfully and effectively in English both orally and in writing. Based on Hymes' communicative competence concept, Henry Widdowson in the seventies (1972; 1973; 1978) developed what is now called communicative language teaching. Widdowson viewed language learning not merely as acquiring the knowledge of the rules of grammar, but also as acquiring the ability to use language to participate in communication and exchange meaningful information. Knowing a language is more than just to understand, speak, read, and write sentences; it extends to embrace how these sentences are used efficiently and intelligibly in interpersonal communication. We do not learn only how to compose and comprehend correct sentences as isolated linguistic units of random occurrence; but also how to use sentences appropriately to achieve communicative purposes and conserve the identity of the communicated messages. There have been many definitions of communicative language teaching, however that of Richards, Platt and Platt (1992) in the Dictionary of language teaching and applied linguistics is a simple and straightforward one. Communicative language teaching in this dictionary is defined as "an approach to foreign or second language teaching which emphasizes that the goal of language learning is communicative competence". The teachers' role in the communicative competence context as pronounced by Czura (2016) is to develop knowledge, skills and attitudes in their students that will help them interact with interlocutors coming from different cultural, linguistic and national backgrounds. According to Crawford (2003), "Communicative approaches to second-language acquisition are based on concepts, theories, and hypotheses that converge around the constructivist paradigm". The constructivist theory of learning is based on the notion that learners construct their own ideas instead of receiving them complete and correct from the teacher or any source of authority. This process of construction is internal, individualised and unique. Constructivist teaching is based on problem-solving and inquiry-based learning activities, with which students formulate and test their ideas, draw conclusions and inferences, and pool and convey their knowledge in a collaborative learning environment. Constructivism transforms the student from a passive recipient of information to an active participant in the learning process. It is the authors' belief that English language learners need a constructivist/com-municative approach to learning English as a second language because the opportunities for learning are authentic and are focused on meaning-making and problem-solving. Communicative language teaching has been reasonably assumed (Widdowson, 1978; Savignon, 1983, 1990) to be based implicitly or explicitly on some model of communicative competence (e.g., Hymes, 1967, 1972). Following the economic, political, and technological changes of the 21st century, communicative language teaching seems to be the best known approach to teaching English as a second or foreign language. Egypt, like many other countries in the world, has been striving to improve English language teaching (Ginsburg & Megahed 2008 & 2011; Ginsburg 2010; Holliday, 1992, 1994, 1996; Snow et al., 2004; Warschauer, 2002). Effective English language skills are certainly vital for the Egyptian workers who seek to participate actively in the global economy and want to have access to the information that forms the basis for social, educational, and economic development (Burns & Richards, 2009). Even at the individual level, a good command of the English language is perceived as a major role in elevating an individuals' socio-economic status and thus is a key to personal success and prosperity. In addition, many Egyptian candidates and scholars seek employment in the Gulf countries, where English is steadily becoming a common second language of communication within the private and even the public sectors. In Egypt, English is seen as an extremely important subject. A good knowledge of English is regarded as a means of guaranteeing better job opportunities. However, in Egyptian public schools, teaching of the English language has been, for long time, based on the traditional approaches that focus on grammar, vocabulary, and translation without paying much attention to communication. Since the late seventies many Egyptian graduate students have obtained masters and/or PhD degrees in the field of teaching English as a second language (ESL) or as a foreign language (EFL) from western countries, wherein the learner's communicative competence has been upgraded to become the ultimate goal of teaching ESL/EFL. Upon return these scholars, have become active advocates emphasising the need for articulation and development of alternative approaches and methods of English teaching. Simultaneously, since the 1970s and the start of the reform movement, the Egyptian Ministry of Education (MOE) - supported by international aid agencies such as the World Bank, the British ODA (Overseas Development Administration), the European Union (EU), and the United States Agency for International Development (USAID) - have directed tremendous efforts to teacher education (Kozma, 2005; El-Fiki 2012). These agencies have collaborated with several national and international higher education and research institutes, training centres, and specialists from the field of teaching English to speakers of other languages (TESOL) to raise teachers' efficacy, provide teachers with the necessary support through varied professional development opportunities, and improve language education, as well as introduce new national textbooks (Darwish, 2016). In order to help your students become 'learners', you have a varied role: to plan and manage the class; to be knowledgeable about what you are teaching and to provide a good model for pronunciation; to guide your students in the process of learning, helping them to think for themselves; to be ready to help with problems. In a communicative classroom, the aim is active involvement, interaction of teacher with students, and of students with students, where language is used, and where real learning can take place. ..... your role is to help your students to take responsibility for assessing their own weaknesses and to ask for more practice or remedial help when they need it. Egypt's educational system has two parallel structures: the secular structure and the religious Al Azhar structure. The Al Azhar structure is run by the Ministry of Al Azhar Affairs and is similar to the secular system, but with more emphasis given to Islamic studies. 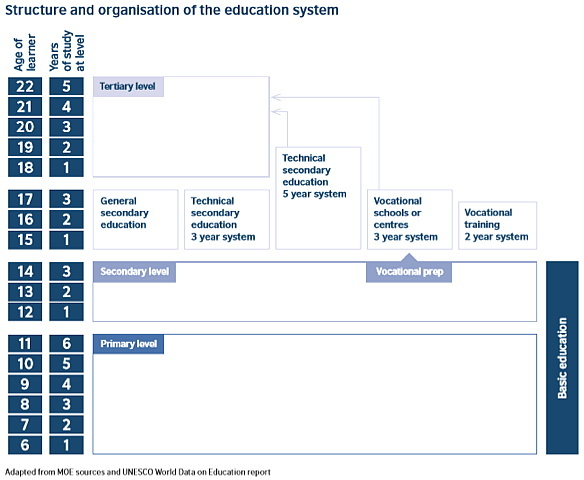 The secular structure is organised and administered by the Ministry of Education (MOE). It is a priority for the State to provide basic education for all children from the age of 6. Parents are obliged to have their children enjoy this right for eight years. The pre-university secular education structure includes the following stages: pre-school education stage (kindergarten) which is an independent educational stage lasting two years for children aged 4-6; compulsory basic education stage which starts at the age of 6 and includes primary and preparatory education. Finally, there is the secondary education stage from age 15 to 17. This stage comprises four subgroups: general secondary, technical, commercial and agricultural. Learners join any of these subgroups according to their performance on the Basic Education Examination at the end of the preparatory stage. Alongside this system, which is provided free to Egyptian citizens, there is a private education sector, divided in the same way and under the Ministry of Education supervision, but demanding high fees. Figure 1 illustrates the Egyptian education system. To what extent do teachers of EFL in Egypt demonstrate an understanding of the basic principles of CELT? To what extent do classroom practices of teachers of EFL in Egypt reflect the CELT approach to language teaching which the Egyptian Ministry of Education requires them to adopt? The present research is descriptive in nature, but adopts the 'mixed methods' that generate and integrate both qualitative and quantitative results and provide better explanation (Greene, 2007). This permits a more complete and synergistic utilisation of the quantitative and qualitative data collected during our study. The mixed method approach has been introduced in order to overcome some limitations of using the qualitative and quantitative approaches separately; as well as to combine their strengths (Teddlie & Tashakkori, 2003). Out of the various mixed method designs presented by Morse (1991) and later by Creswell et al. (2003), the present research adopts the sequential explanatory design. According to Creswell et al. (2003), this design is "characterized by the collection and analysis of quantitative data followed by the collection and analysis of qualitative data", where extra emphasis is given to the quantitative data, and then both methods are integrated in the interpretation phase of the study. One of the advantages of this design, as Morse (1991) pointed out, is that the qualitative data are useful in examining in detail any unexpected results that may arise from the quantitative data. The sequential explanatory design was a good fit in the current study because of its congruency with the quantitative aspect of the study. The aim of capturing the reality and experiences of the English language teachers was much enhanced by the qualitative data obtained from the interviews, which followed the quantitative data collection from observations and questionnaires. To guarantee the validity of the work presented in the present research study, the authors have attempted to accomplish what Sarantakos (1993) referred to as 'argumentative validation' and 'ecological validation'. Argumentative validation is established through presentation of findings in such a way that conclusions can be followed and tested. Ecological validation is established through carrying out the research in the natural environment of the students and the teachers, which is the schools, the staff room, and the classrooms. By choosing research instruments that are suitable and significant for the study purpose, the authors are also achieving 'internal validity'. One of the suggested ways of achieving a higher degree of validity is the use of triangulation of data and methods. "Triangulation techniques in social sciences attempt to map out, or explain more fully, the richness and complexity of human behaviour by studying it from more than one stand point" (Cohen, Manion & Morrison, 2001). Of the principal types of triangulation used in research, the present study used data, methodological, and space triangulation. While carrying out the research, some difficulties were encountered, which imposed some limitations on the study. One of these constraints arose from political and social changes that occurred in Egypt following 2011 revolution. Obtaining letters, which were addressed individually to each headmaster of each school, turned out to be insufficient, as permission from the Director of Security Administration had to be sought. Moreover, after obtaining this, a further security permission was needed for each school. These requirements limited the scope of the study. The research study was implemented in secondary public schools in Giza governorate, Egypt, during the 2012/2013 academic year. Three instruments were implemented: a scaled observation, a questionnaire, and an interview. These were developed by the authors specifically for this study to answer the research questions and provide a clear picture of the teaching method applied in teaching English in Egypt. Based on our understanding of CLT from its specialists and pioneers (Brumfit & Johnson, 1979; Canale, 1983; Howatt, 1984; Huang & Liu 2000; Littlewood, 1981; Nattinger, 1984; Nunan, 1987; Nunan, 1989; Savignon, 1983, 2002 & 2003; White, 1989; Widdowson, 1990; Widdowson, 1996), to name just a few, the authors designed a validated, comprehensive and highly structured classroom observation checklist. The observation checklist consisted of 40 statements on a Likert scale. These items were designed to capture the extent to which CLT was implemented as an official approach adopted by the Egyptian MOE. Teachers responded to the 40 items on a 5-point rating scale (4 = always, 3 = frequently, 2 = sometimes, 1 = rarely, 0 = never) (Appendix A). The scaled checklist was used by the researchers in order to increase the reliability of collected data as well as to reduce the impact of the expectations of the first author as observer. The researchers arranged the 40 items in the CELT observation checklist into five main categories (Table 1 and Appendix A). The checklist was designed and implemented in English. A panel of English language and English methodology professors, four from Helwan University and three from Akhbar El-Yom Academy, undertook validation of the checklist and accepted it as reflecting CLT principles. Prioritise fluency above accuracy and comprehension over structure. In addition to its possible benefit as an observation checklist that can be used by teachers' supervisors, this checklist could also be used by teachers for self-evaluation and self-awareness of the CELT standards. The first author of this manuscript carried out the English teaching classroom observations in five secondary public schools in Giza governorate, Egypt. Two English teachers were randomly selected in each school for the observation protocol and their classrooms were observed every second week for a total of five observation visits. A total of 50 observations were conducted, using 40 checklist items, thereby obtaining an overall number of 2000 observed remarks. A short 5-point Likert scale questionnaire in English was administered to 100 English teachers in secondary schools in Giza governorate, including the 10 observed teachers. Do you speak only in English while teaching your lessons? Are students allowed to use Arabic in your class? Do you correct errors to ensure that accuracy comes before fluency? These questions were asked to reveal a larger picture of the reality of implementing CELT in Egyptian English language classes, as well as an indication of teachers' awareness and understanding of the principles of CLT. Q1 - Do you think the students are motivated to learn EFL? Q2 - How can a CELT environment be created in the classroom? Q3 - Do you face any difficulties in implementing the CELT? Administrative, facilities, ... etc. The interviews addressed the first research question of the study, as well as identifying the problems the teachers perceived in implementing CELT and preventing them from following this approach (i.e. "by the book"). The first question served as an "ice breaker" besides probing teachers' perceptions of students' motivation to learn EFL, which plays a major role in the successful implementation of a communicative, constructivist classroom environment. The research was conducted at Giza governorate, the second biggest governorate (city) in Egypt, situated on the west bank of the River Nile, opposite Cairo. The nine schools participating in the current study were all general secondary schools, five for girls and four for boys. Three were 'experimental schools' which are considered to be best practice, model general schools. All schools were middle socio-economic areas. Class sizes were in the range 40 to 60. Students participating in the research were from the upper secondary stage. The authors chose this stage because it was believed that this final stage of education would facilitate the teachers' tasks in the implementing CELT, thus providing good subjects for investigation, especially as these students had studied English since their fourth primary grade. Students at this stage receive six English language lessons weekly, each lasting for 30-45 minutes. All teachers were chosen randomly to fit the purpose of the study (Ivankova et al., 2006). All were Egyptian, native-Arabic speakers. The total number of participating teachers was one hundred (78 males, 22 females), ten of whom were observed and also interviewed. Their teaching experience ranged from 2 to 15 years, and ages from twenty-six to forty-two years. Table 2 summarises the numbers, data collection instruments and sampling conditions. Wherein the numerator value (the categorical score) is the summation of the score for each statement in each category multiplied by its frequency observation score (always = 4; frequently = 3; sometimes = 2; rarely = 1; never = 0). The denominator in the equation is a product of the number of items that belong to each category multiplied by the number of their observations (50) and the maximum score for each item (4). Further explanation of this equation is given in the Results and Discussion sections. The collected data were analysed using SPSS to calculate the means and total number of the participants' responses, frequency and percentage marking on each response for each statement. These quantitative data were sorted into several categories to integrate with qualitative data. All the interviews were transcribed after being translated into English; careful attention was paid to the translation process. The authors relied on their own proficiency in English as well as their knowledge and understanding of the discursive habits of the population. The interviews were carefully reviewed, exactly transcribed then imported to a computer. The imported data was categorised in accordance with the questions and themes. The observation checklist (Appendix A) used in this study stemmed from solid understanding of the principles and practices of CLT. By applying the previously mentioned equation on the data obtained to evaluate the extent to which ten teachers from five public schools followed each of the CELT principles, the data in Table 3 were obtained. Appendix B provides a detailed breakdown of the classroom observation results classified into the five CELT categories. * CELT principles: Target language use; fluency vs. accuracy; correction purpose; grammar in communication; language skills. In order to explain how the equation was applied to generate the category data in Table 3 from the observations of individual statements (or items) shown in Table 1, consider a calculation example of the first category, i.e. lesson planning. Lesson planning was observed using six statements in the observation checklist (statements 14, 15, 18, 19, 20 and 21). The calculation example is depicted in Table 4, noting that the checklist included 50 observations for each statement (5 schools x 2 teachers x 5 visits) that were distributed according to the degree of their CELT practice according to the scale: always = 4; frequently = 3; sometimes = 2; rarely = 1; and never = 0, see Table 5. By considering "lesson content" and "lesson planning" as one category that occurs prior to classroom implementation, one can find out that the checklist indicators are well-distributed among the CELT categories. Some of the CELT indicator statements occur in more than one category but they have differences in their relative closeness to each category. This is expected, based on CELT implementation being an ecological and holistic approach with interrelated and interdependent factors. The highest percentage of total scores (30.3%) was related to "lesson content" (category 2). This is predicted and supports the literature discussed previously, indicating that the content is pre-set by the MOE in line with CLT curriculum design principles. In order to provide a valid decision regarding the 'lesson planning' category, the researcher conducting the observation asked to see the teachers' planning. A key feature of the communicative approach to language teaching is to use the target language, in this case English, as often as possible. In fact, Table 3 also reveals that, despite the teachers' awareness of the MOE adoption policy of CELT in teaching English as a foreign language, the worst percentage (2.1%) was for teachers' implementation of CELT framework principles (category 5). Arabic was the dominant language used in all the classes observed, as it probably is in most English classes in Egypt. English was not used for any real communication; the English used by teachers as well as students was restricted to reading the textbook and answering the drills. Data indicate that the teachers nearly all lack awareness and a clear conception of the communicative competence approach. The last row of Table 3 records that only 16.8% of the overall English teaching is attaining the CELT approach, or, more than 80% of the teaching dynamics is not in accord with CELT. The overall practice of the 10 teachers compared to the ideal CELT approach was calculated as percentage of the number of checks of each frequency term (Table 6 and Figure 2). Figure 2 shows the marked increase from relatively small 'Always' to 'Rarely' frequencies, to the relatively large 'Never' indicating that the practices of the observed teachers were far below the CELT standards. practised in five public Egyptian schools. N=2000. Concentration on language form rather than use and appropriateness. A tendency to favour accuracy-focused activities rather than fluency-focused. An attention to exercises on the language rather than communication tasks to be achieved through the language. In addition to the observations discussed above, 100 English teachers, including the 10 who were observed, completed a short questionnaire (Figure 3). It is evident that achieving a balance between accuracy-based tasks and fluency-based tasks was an issue in the classrooms. Only 19% spoke only English in class, with 78% of the teachers either "always" or "frequently" allowing their students to use Arabic in class, and 88% of the teachers were biased towards accuracy over fluency. This section explores the questions discussed in the interview sessions. Q1: Do you think the students are motivated to learn EFL? T1: Yes absolutely. There are even some students who could excel their colleagues in the private schools. A lot of them like the English language. T2: Yes, they like it very much. However, there are occasions where the students hate the language because of the teacher. It all depends on the teacher. T3: Yes, some students have very high motivation. T5: Not all of them, and there is a wide range in their level. For instance, in last month's written test their grades ranged from 5 till 19 out of 25. Q2: How can a CELT environment be created in the classroom? T4: Even if the syllabus does not do that, it is the teacher's duty to try and establish this in class. T2: It is very hard for us, as teachers, to perform this without any guidance from the inspector or the head teacher. T5: Many other teachers do not bother; they care most about the final grades. T1: We were not really given clear instructions on how to implement this. T3: We are not used to it and neither are the students, every teacher tries out and experiments in his own way. Q3: Do you face any difficulties in implementing the CELT? This question invited respondents to highlight what they perceived as the main problems, in order to fully understand the current state of implementing CELT. Four common challenges were quoted. The large sizes of classes, naturally, have negative effects on the quality of teaching and learning processes inside classes. Teachers in such crowded classes face numerous difficulties with respect to wide ranges of linguistic ability and motivation. In such conditions, discipline is a major problem, especially in a system where discipline is considered as very important. Teachers do not like the noise from other classes. If students talk at the same time or become over-enthusiastic, the class becomes "unacceptably" noisy. Thus, student involvement is very restricted. This is just the opposite of the type of environment which is considered to be positive for communicative language teaching. Egyptian schools depend solely on the MOE for all supplies. Due to pressing economic conditions, this dependence provides only small budget for schools. Teaching aids do not go beyond the traditional: blackboard and chalk. T1: I use tapes very rarely, this is because most classrooms do not have working power points. Sometimes there aren't enough tape recorders to use because most of them are out of order. T4: Very often we have a power failure, which is a very common phenomenon in Egypt. As a result, I depend mainly on my reading; especially that the students find it very difficult to understand foreign speakers. It is worth pointing out that the teachers are referring to tapes and tape recorders as facilities, even though these are now obsolete technologies. Because of the increase in population, and the lack of resources and funding, two sessions are held every day in the same school building. These two sessions represent two different schools. One session starts from 8.00 am to 12.00 noon and the other from 12.30 pm to 4.30 pm. This system reduces the teaching hours per day with the result that the duration of all periods, including English, is shortened. At least five minutes are lost from the lesson for administrative matters such as attendance records and teachers moving between classrooms. This has negative effects on learner-oriented teaching performance. Egyptian students at all levels tend to be examination oriented. Teachers spend most of the class time preparing students for exams, by giving them readily answered questions covering the novel, or written letter samples around the popular topics that come in the tests, for rote learning, instead of helping the students to practise using English, and develop their competence in language production and comprehension. T4: Yes, of course. I provide them with leaflets covering different aspects of the curriculum: grammar, novel... how to write a paragraph; different ideas and sentences to include in different paragraphs, how to write a letter, so they would study these notes and get good marks in the exam. T1: There is a regular monthly written test. As for listening, we usually use those marks for attendance, behaviour, and participation. The present research aimed at answering two questions. The first question was to what extent do Egyptian EFL teachers comprehend the basic principles of CELT adopted by the Ministry of Education? The answer is negative, as the results suggest that despite all the initiatives taken by the Egyptian Ministry of Education to change English language pedagogy, classrooms in public schools remain mostly unchanged and traditional approaches and methods of teaching English remain in use. The findings here accord with studies in countries with similar cultures and conditions, e.g., Egypt (Fairley & Fathelbab, 2011), Turkey (Coskun, 2011); Iran (Razmjoo & Riazi, 2006; Safari & Rashidi, 2015); Sultanate of Oman (Wyatt, 2009); Iraq (Abdullah, 2015); Saudi Arabia (Farooq, 2015; Alsowat, 2016); Yemen (Bataineh et al., 2011; Al-Sohbani, 2013); Jordan (Asassfeh et al., 2012); Libya (Abukhattala, 2016), and Korea (Han, I. 2016). This finding also agrees with the World Bank which found that evidence of improvement is still limited (World Bank, 2007). El-Fiki (2012) and references therein suggested a number of factors impede CELT implementation, e.g., social psychological factors such as people's attitudes and their deeply rooted traditional beliefs about teaching and learning; economic factors including the lack of sufficient funds, resources, and materials; educational factors such as system imposed regulations, curriculum issues related to goals, content and assessment, teacher preparation, the entrenched views on what constitutes appropriate language teaching and learning, and environmental and physical settings (such as room conditions, class size, etc.). As for the second research question, addressing the degree of implementation of CELT in classrooms, the outcomes seem to be disappointing, as students in secondary schools are still struggling to achieve the desired level of proficiency in English. This can be concluded from the observation checklist results which clearly indicate a serious divergence from CELT best practice. The teachers are not up to the approach, and the classroom environment and resources are too limited. The results indicate that CELT is not the norm in public schools, and it is unfortunate that there are still many obstacles that prevent even experienced teachers from adopting CELT. In addition to the reasons brought forward by the teachers, the authors believe that traditional, grammar-based examinations, lack of spare time for preparing communicative materials to supplement the MOE's text-based materials, and anxiety among students are also factors in the problem. Another problematic aspect of the communicative approach is that it requires teachers who are competent in the English language. Teachers should 'possess a very high level of competence ... always prepared for any linguistic emergency' (Marton, 1988). This is a problem in the Egyptian context where very few teachers have had the opportunity to achieve high levels of proficiency in speaking the language, in their academic institutes or their personal life. The authors also believe that teachers have to believe strongly in the CELT approach in order to create an effective, student-centred learning environment. It is unfortunate to find that despite the training and education funds that have been spent, there is low return on investment. The process of teacher preparation is instrumental but not magic in the transition of English teaching methods to communicative competence; other factors are just as important as teacher competency. CELT requires four groups of roles: the teachers, the students/learners, the instructional materials and educational system, along with school administration. The educational system and school administration in many developing countries may exaggerate the level of performance and outcomes. As the role of a CELT teacher is diverse (facilitator, resource organiser, guide, researcher, learner, analyst, counsellor, group-dynamic orchestrator, etc. ), training becomes instrumental for CELT implementation and effectiveness. The authors believe that because English teachers in Egyptian public schools are non-native English speakers, lack of communicative language proficiency among them may add one more reason why training is seriously needed. The required change in students' role is a feature of the communicative approach that is problematic in cultures where learners are traditionally expected to be recipients of knowledge rather than active participants in its creation. These concerns will require much attention if CELT is to continue to gain practical momentum in the future. The findings from the present study can provide Egyptian EFL teachers, educators, policy makers and interested scholars with information about the current state of CELT performance in Egypt, and, as summarised below, recommendations for progressing the adoption of CELT. It may be beneficial at this point to give some recommendations on how to reduce the gap between theory and practice of CELT in Egypt. The following is a list of recommendations that should not be interpreted as exhaustive. These recommendations have been categorised to facilitate implementation. The first recommendation has to be providing the teachers with professional in-service training to develop their understanding of and abilities in implementing these principles. Without such training other actions are likely to have limited impact. Administration should arrange professional development courses for teachers to develop CELT environments, materials and instruction. In-service training is necessary within institutions to ensure that teachers are properly supported for implementing communicative approaches in the classroom. Syllabus experts must re-design the English language curriculum to help teachers in developing the communicative competence of students. Schools should reduce or adjust the number of students in the English teaching classroom or laboratory to the standard size consisting of 20-30 students. Administration should provide teachers access to resources and audio-visual aids for effective implementation of CELT. Teachers must plan lessons, prepare CELT activities, and create CELT environments to develop communicative competence of the students. Teachers should provide opportunities for learners to develop both fluency and accuracy in a CELT environment. Improving students' listening comprehension skills helps to develop the communicative competence of foreign language learners. Teachers must make a real communication effort using the target language and motivate learners to do so. Teachers should link the different skills such as listening, speaking, and reading together, since they usually occur mutually in the real world and in real life contexts. Effective CELT-environment assessment instruments should be developed to assess students' communicative competence rather than just their grammatical competence. Creating a space for self-evaluation and debate regarding the current status of CELT. Providing some guidance to teacher educators about a number of factors relating to CELT effectiveness. Contributing information about what could be done to promote better CELT education services for the benefit of the students. Both authors would like to thank the two anonymous reviewers for their highly professional feedback which indeed had its impact on the manuscript. The authors also find it difficult to express in plain words their debt and appreciation to Mrs Abla El-Rouby and Mr Kamal Ibrahim for always being there in due time. Al-Sohbani, Y. A. (1997). Attitudes and motivations of Yemeni secondary school students and English language learning. Unpublished doctoral thesis, University of Pune, India. Brumfit, C. & Johnson, K. (Eds.) (1979). The communicative approach to language teaching. Oxford: Oxford University Press. Burns, A. & Richards, J. (Eds.) (2009). The Cambridge guide to second language teacher education. Cambridge, England: Cambridge University Press. Canale, M. (1983). From communicative competence to communicative language pedagogy. In J. C. Richards & R. W. Schmidt (Eds. ), Language and communication. London: Longman. Cohen, L., Manion, L. & Morrison, K. (2001). Research methods in education. London: Routledge Falmer. Crawford, A. N. (2003). Communicative approaches to second-language acquisition: A bridge to reading comprehension. In G. G. Garcia (Ed. ), English learners: Reaching the highest level of English literacy (pp. 152-178). Newark, DE: International Reading Association, Inc.
Creswell, J. W., Plano-Clark, V. L., Gutman, M. L. & Hanson, W. E. (2003). Advanced mixed methods research designs. In A. Tashakkori & C. Teddlie (Eds. ), Handbook of mixed methods in social & behavioral research (pp. 209-240). Thousand Oaks, CA: SAGE. Greene, J. (2007). Mixed options in social inquiry. San Francisco: Jossey-Bass. Holliday, A. (1994). Appropriate methodology in social context. Cambridge, England: Cambridge University Press. Holliday, A. (1996). Large- and small-class cultures in Egyptian university classrooms: A cultural justification for curriculum change. In H. Coleman (Ed. ), Society and the language classroom (pp. 86-104). New York: Cambridge University Press. Howatt, A. (1984). A history of English language teaching. Oxford: Oxford University Press. Hymes, D. H. (1966). Two types of linguistic relativity (with examples from Amerindian ethnography). In W. Bright (Ed. ), Sociolinguistics: Proceedings of the UCLA Sociolinguistics Conference. The Hague: Mouton, pp. 114-167. Hymes, D. (1972). On communicative competence. In J. B. Pride & J. Holmes (Eds. ), Sociolinguistics: Selected readings. Harmondsworth, UK: Penguin. Ibrahim, M. K. (2004). The challenges of teaching English as a foreign language to Egyptian students with visual impairment. Unpublished doctoral thesis, University of Manchester, UK. Marton, W. (1988). Methods in English language teaching: Frameworks and options. New York: Prentice Hall. Ministry of Education (1994). The curriculum of secondary stage. Cairo: Ministry of Education. Ministry of Education (2000). The new English syllabus: Aims and implementation. Cairo: Ministry of Education. Nunan, D. (1989). Designing tasks for the communicative classroom. Oxford: Oxford University Press. Richards, J., Platt, J. & Platt, H. (1992). Dictionary of language teaching and applied linguistics. London: Longman. Savignon, S. J. (1983). Communicative competence: Theory and classroom practice. Reading, MA: Addison-Wesley. Savignon, S. J. (1990). Communicative language teaching: Definitions and directions. In J. E. Alatis (Ed. ), Georgetown University Round Table on Language and Linguistics, pp. 202-217. Washington, DC: Georgetown University Press. Snow, M. A., Omar, M. & Katz, A. (2004). The development of EFL standards in Egypt: Collaboration among native and non-native English-speaking professionals. In L. D. Kamhi-Stein (Ed. ), Learning and teaching from experience: Perspectives on non-native English speaking professionals (pp. 307-323). Ann Arbor, MI: University of Michigan Press. Teddlie, C. & Tashakkori, A. (2003). Major issues and controversies in the use of mixed methods in the social and behavioral sciences. In A. Tashakkori & C. Teddlie (Eds. ), Handbook of mixed methods in social & behavioral research (pp. 3-50). Thousand Oaks, CA: SAGE. Widdowson, H. G. (1972). The teaching of English as communication. In C. Brumfit & K. Johnson (Eds. ), The communicative approach to language teaching. Oxford: Oxford University Press. Widdowson, H. G. (1973). Directions in the teaching of discourse. In C.Brumfit & K. Johnson (Eds. ), The communicative approach to language teaching. Oxford: Oxford University Press. Widdowson, H. G. (1978). Teaching language as communication. London: Oxford University Press. The observation checklist, teacher self-evaluation and self-awareness, of communicative English language teaching (CELT) was designed, developed and used by the authors. 1 Teacher uses target English as the normal and expected means of classroom communication. 2 Teacher keeps use of the native (Arabic) language totally separated from use of English unless it is absolutely necessary. 3 Teacher avoids dominating the talk-time and does not rely on a word-for-word Arabic translation to explain meanings. 4 Teacher focuses on student's meaningful fluency rather than form/ structure/ grammar accuracy while communicating in English. 5 Teacher provides students with opportunities for extended listening. 6 Teacher uses authentic and social life communication to motivate English language use. 7 Teacher corrects students' errors with primary focus on exchangeable meaning rather than structure or form. 8 Teacher provides students with hands-on realistic situations and experiences accompanied by oral and written use of English. 9 Teacher accelerates communication by teaching class functional chunks of the English language. 10 Teacher makes sure that reading and writing for communication are strongly complemented and integrated with listening and speaking. 11 Teacher uses questions and activities that provide real exchange of students' knowledge and opinions. 12 Teacher encourages students to ask questions as well as to answer others' questions. 13 Teacher introduces and practices grammatical structures and vocabularies in meaningful communication contexts. 14 Teacher plans lesson to emphasise English language in use. 15 Teacher balances language, culture and the subject content goals in lessons plans. 16 Teacher presents grammar through, and for, usage rather than critical analysis. 17 Teacher draws information and experiences from the social life and target culture(s). 18 Teacher designs classroom activities to include experiences with literature or authentic sources from social life and target culture(s). 19 Teacher plans activities that provide students with successful learning experiences. 20 Teacher plans the lesson to incorporate both new and familiar material. 21 Teacher carefully plans, and follows up, individual activities as important part of the overall activities. 22 Teacher makes sure that the lesson, content and activities are appropriate to age and developmental level of the class and to the target culture(s). 23 Teacher provides logical, smooth and timely transition from one activity to the other. 24 Teacher gives clear classroom directions and concise examples and keeps English learning as a student-centred process. 25 Teacher gives many, varied and concrete materials and uses a diversity of classroom techniques and strategies to cope with different learning styles. 26 Teacher uses visual and audio techniques as well as role play dramatisation and group activities effectively to cover all learning styles. 28 Teacher maintains a pace that keeps the learning momentum and creates a sense of direction. 29 Teacher gives activities and games frequently to fit the lesson content and English communication outcomes rather timely and logically. 30 Teacher makes sure that no student is left behind and all students are active throughout the class period both indiv-idually and in pairs or groups. 31 Teacher encourages and balances all patterns of interaction (teacher/ student, student/ teacher, student/ student). 32 Teacher prevents unbalanced or dominating participation in group activities. 33 Teacher appears enthusiastic and motivated while in a two-way communication of English to his/her class. 34 Teacher shows patience with student attempts to commun-icate fully in English and acknowledge students' differ-ences in their level of fluency. 35 Teacher gives students timely, varied, appropriate and motivating feedback. 36 Teacher leads the class positively, promptly and in a non-disruptive or intrusive way. 37 Teacher is fully aware of students' level of enthusiasm and motivation. 38 Teacher makes him/her self and students feel the gladness and happiness of being a member of the English class. 39 Teacher attracts other students to join his class and learn English for life not just for the final exam. 40 Teacher balances the score of classroom testing in terms of communication, i.e., to emphasise reading, writing, listening, and speaking. Results of classroom observation for CELT practice in five public schools in Egypt. The data were collected from two observed teachers in each school, for five consecutive visits. Authors: Dr Mona Kamal Ibrahim (corresponding author) is Deputy Dean and Head of English Department, College of Education, Humanities and Social Studies, Al-Ain University of Science and Technology, United Arab Emirates. She is on a sabbatical leave from the Faculty of Education, Helwan University, Egypt. She received her PhD in the philosophy of education from Manchester University, UK. She has a long experience in teaching English language skills as well as methods of teaching English as a foreign/second language to both undergraduate and postgraduate students. She is also a licensed internationally certified trainer and human resource consultant by the International Board of Certified Trainers (IBCT). Dr Yehia A. Ibrahim is Professor Emeritus and Educational Consultant, Assiut University, Assiut, Egypt. Following obtaining his PhD degree, he was certified a Harvard IEM Diploma in Educational Management. Dr Ibrahim worked with several US universities as a visiting, adjunct or distinguished professor. In addition to his academic degrees and career, Dr Ibrahim is internationally accredited expert in several psychological and organisational disciplines and approaches. Dr Ibrahim has provided a number of professional guides in many fields, and regularly contributes articles to leading conferences, training journals and websites.